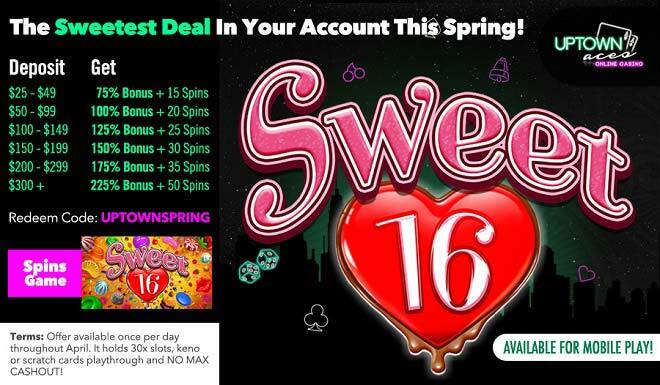 April is all about sweet Spring wins Uptown – and you get to fall in love with these when you spin the reels of our popular Sweet 16 slot with up to a 225% Match + 50 Sweet 16 Spins! Find your way towards all kinds of sweets on the reels of Sweet 16 where you’ll savour in jelly beans, lollipops and toffees . Win more with collapsing reels and bonus round features with increasing multipliers that may go up to 20x! Make April the sweetest winning month Uptown with your deposits of as little as $25 and get ready to pick up some Sweet 16 wins! Offer available once per day throughout April. It holds 30x slots, keno or scratch cards playthrough and NO MAX CASHOUT!